A pleuch (cutty form plou) is a semple machine uised in fermin. A pleuch is pulled athort the grund bi a body or ainimal or tractor. Whan pulled athort the grund, the plou lifts up syle an maks twa lines o muild ahint it. The syle lifted bi the pleuch is mair lowse nor afore. Grund that haes been pleuched is a guid place for a fermer tae growe fuid. 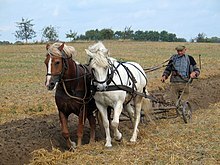 Wikimedia Commons haes media relatit tae Ploughs. This page wis last eeditit on 23 Apryle 2018, at 00:24.